Teachers, you know that warm fuzzy feeling you get when you're asked a great question? One of those questions that isn't just on topic, but is asked for clarification. A question that not only you can answer in depth, but you know, had it not been asked, the whole class may have been left with only a superficial understanding of what you were trying to convey, and now thanks to this question you get a second chance to make it all crystal clear for everyone? Kimberly, thank you for asking about my Morning Meeting Kit! I mentioned it in passing last week, but thanks to you I thought, "Why not take the whole thing apart and show everyone what it actually entails?" 1. The box. I originally had all these things strewn around a table, and it was a little bit maddening how messy it looked. Then I put it all into a tub, but even that looked like a box of junk. In the end, I opted for vertical storage. It works beautifully. 2. My "Shares Sign Up Board." 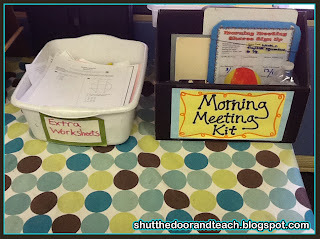 I blogged about this system, but essentially I have a student roster, and each student needs to complete a task in their box in order to sign up to share in the morning. There's a bit more to it, in that it's got a sheet protector to save paper and grade 4 common core aligned tasks to complete, but that's the crux of it. 3. My Mystery Person envelope. I got this idea from a teacher's forum (if I can find who to credit I will update this post). I told the kids that two behaviors that I want them to work on is not blurting out, and being organized (specifically: quickly taking out the appropriate materials during transition times to get ready for that subject). At the start of the day, I pick two names, but don't tell them who. Then, throughout the day I watch those two students especially to see if they are completing the task, while reminding the class, "I see so and so is (name the desired behavior); I wonder if they are the Mystery Person!" Everyone in the class then snaps to! If a Mystery Person does not do what they need to do, I tell the class that for today they will remain a mystery! However if they do, they get a round of applause/bragging rights, and they can pick out a sticker from my portfolio. 4. Student of the Month information. We focus on character education at my school, and we have a different trait that we strive to improve each month (such as cooperation, empathy, and responsibility). This file folder contains a list of the traits, definitions to help me guide my discussion at the start of each month, and slips of paper for students who need a "warning" for not making good choices to improve themselves in this area. 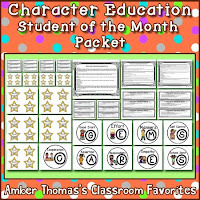 I have this Student of the Month system available for purchase as well. 5. Character building anchor charts (from Pinterest!) that I love, which I pull out on an as needed basis. 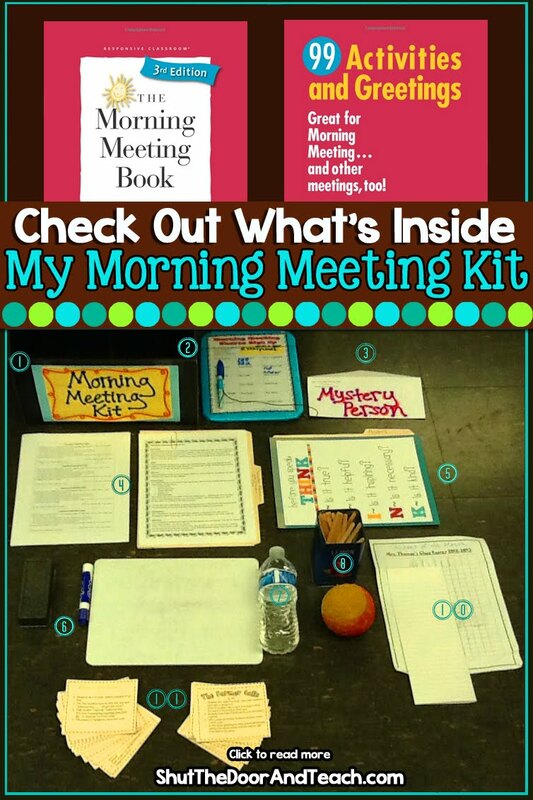 You can see my Pinterest collection of classroom posters here. 6 & 7. Game materials include a white board, eraser, marker, and ball. These come in handy for various games we play. The bottle of water is actually out of place in this shot; it's for me for wiping off the Shares Sign Up board each week. 8. The kids' names on sticks. Originally I used their lunch sticks to pull for games and comments, but it started to become a hassle to use the sticks for a dual purpose on opposite sides of the room and at different times (thanks to rotating specials times). It became more practical to have a new set right in the kit. Also, I use these to pull names for the Mystery Person. Then I use the lunch sticks for the rest of the day. Because of course, if I used the lunch sticks for the Mystery Person, then I pulled Billy's lunch stick to answer a question in math, Billy knows he's not the Mystery Person today. This way it can stay a mystery! 10. More Student of the Month information. The kids nominate each other every Monday for Student of the Month, so I have a roster (it's partly covered there to protect privacy) to keep track of each topic, who's been nominated for the topic, and who the eventual "winner" was. 11. A pile of "Greetings" and a pile of "Activities." I usually change these up each Monday, so if I feel like trying something new, or I want a specific purpose (such as cooperation) I can just flick through these for inspiration. I did not make these; a simple Google search yielded loads of them for free, but I got the bulk of my Greetings and Games here, from Mrs. Bainbridge. 12. Twitter Board: Not pictured above, but I blogged about my Twitter board as a new Share system a few weeks ago. This is so that anyone who didn't sign up, yet had big news could still have it posted, and if I feel it's big enough to talk about I do. So that's my Morning Meeting Kit! Just a bunch of stuff that I found myself scrambling for each morning that I finally put altogether. 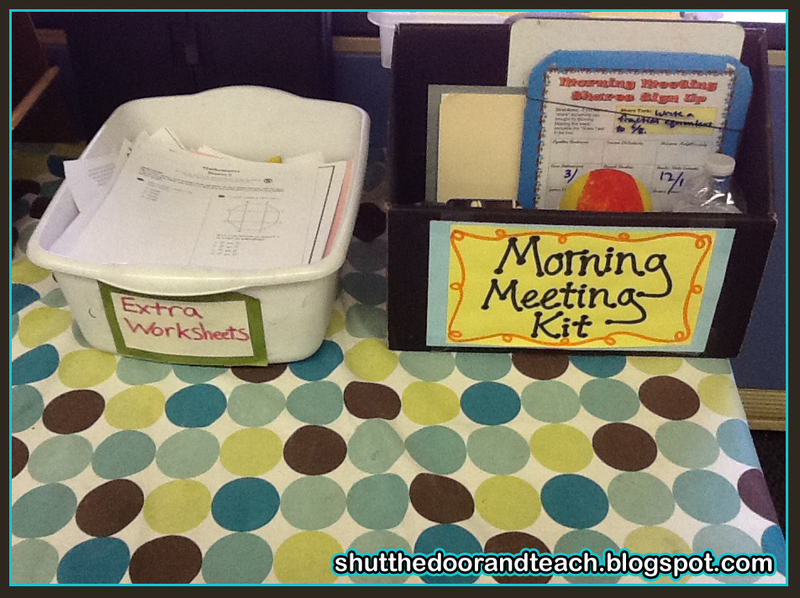 I love it because now I'm starting out each morning super organized, and I think the kids have noticed that too. Thanks again for your question, Kimberly, and I wish you loads of luck with your first classroom! For your shares board - do students sign up each day, or do all students who want to share that week sign up on Monday? If they all sign up at the beginning of the week how do you decide who shares each day? I explained a bit about this over on my collaborative blog, "All Things Upper Elementary." Students are allowed to sign up any day of the week. I never had a problem with more than 15 kids signing up on Monday ;) If I saw a line forming at the clipboard I would just say, "It looks like there are more than 3 people, so [students at the end] you'll have to wait until tomorrow." Those who remembered the next day would once again be "first come, first served." In terms of deciding, I go with my gut. If a child who is normally quiet wants to share, I want to hear them. If I know there is a huge life event going on with a student that they shared with me and want to tell the whole class, I will make sure they share ASAP. If there's no other extenuating circumstances, I mainly go alphabetical starting at the beginning one week and the middle the next week. Hi. I've tried to click on your links and several do not work anymore. I realize this post is about 3 years old, but I'd be interested in the "All things upper elementary" blog and your "greetings and games." Thanks! Sorry I only just saw this (I wish I knew how to get notifications when I receive blog comments). I'm not sure why the links aren't working for you! I just checked them all and the All Things Upper Elementary blog links worked for me. Everything but Mrs. Bainbridge's resource was working, so I did have a quick Google and updated that link. I hope you enjoy the activities. Thanks for reading!